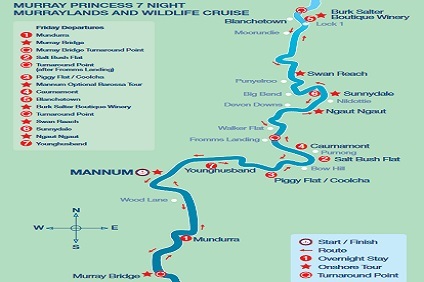 Mid-afternoon the PS Murray Princess departs historic Mannum, the birthplace of the Murray River trade and communication, and heads downriver while you enjoy a Welcome Dinner. As we cruise under floodlight to our overnight mooring at Mundurra, you may see nocturnal wildlife on the riverbank. Watch for kangaroos, hairy-nosed wombats, tortoises, egrets and many other species. Our on-board entertainer provides music for the night owls. In 1879 the first bridge to span the Murray River was built at Edwards Crossing, which quickly became the bustling township of Murray Bridge. After a hearty breakfast, choose to join a guided tour of the town’s historic landmarks and local attractions or go on a wildlife tour at Monarto Zoo (additional cost). Those who choose to experience Monarto Zoo will arrive back on board the Murray Princess in time for lunch then join us in the Sturt Dining Room for a special presentation on the bounty of food and wine produced in the Riverland. This afternoon, we continue our journey upriver and tonight we moor at Salt Bush Flat. After dinner, enjoy being entertained by our talented crew. we explore the maze of the river and the birdlife is amazing. Watch for darters, herons and egrets feeding along the river’s muddy edges. The afternoon offers a choice of bocce or fishing challenges before joining the Captain and Officers for a spectacular Captain’s Dinner and Dance. mooring at Caurnamont. Our on-board entertainer provides music for the night owls. a must for every visitor. Cruise downriver after lunch and take in the tranquillity as the landscape slides by. When we arrive at Sunnydale, it’s all ashore for the Woolshed Show as we recreate typical Australian woolshed history. Later we visit the Native Wildlife Shelter where some of South Australia’s most interesting native animals are cared for. And then of course, there is the great Aussie Barbecue – cooked and served in a bush setting on the banks of the mighty Murray River. An optional Nocturnal tour by tractor and cart is available after dinner (additional cost).